There are many different types of vape pens and tanks available in the market, we're here to help you figure out which is the right one for you. The biggest point is what type of mix the tank is made for, some are made for a nicotine PG/VG mix. Other vape cartridges are geared towards legal cannabis oil. The good news is Farm to Vape will allow you to vape your cannabis concentrate in any of these style tanks. In the nicotine world, there are RDAs or box mods as they're sometimes called. These types of vapes have custom wound coils and cotton. When cannabis oil is mixed with Farm to Vape, the boilable dropper bottle allows you to drop you cannabis oil vape juice right on your RDA. This is the preferred method of nicotine style device, it hits harder and bigger than any other type of vape. 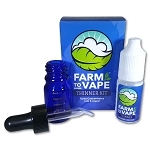 Farm to vape mixed with cannabis oil also works in cheap disposable vape pens. In the cannabis world, there are "oil hole" tanks specifically designed to take the thicker viscosity mixture that contains cannabis oil mixed with Farm to Vape. They come in ceramic and wire coil wrapped around a fiber tube. The pros of the the wire wrap coil is that you can instantly hit it and they require last battery power to operate. The downfall is if you make your mix too thick of a viscosity i.e. too low of a ratio, you will taste the burning fiber tube if you hit too many times too quickly. The advantage of a ceramic tank is ceramic is the heating element and the fiber tube combined in one ceramic device that won't degrade. You can use a thicker viscosity in ceramic tanks than you can in wicking coil cartridges. The disadvantage of ceramic cartridges is you have to preheat them for a second or two before you inhale, and they take more power to operate. Both style tanks are made in leak proof designs. We recommend the Itsuwa Liberty I as the best coil / wicking type. We recommend the 1.8mm oil hole size. We recommend the BB Ceramic tank as the best ceramic tank. Can I use regular nicotine 70vg / 30pg in a cartridge meant for thick oils?